Bike fitting as much an art as it is a science and the bike is symmetrical but we are not! Bike fitting in the raw form is purely a “bio-mechanical output”. Workable angles need to be in place for the body to maximize on leverage. The angle rotation of the pelvis to the bend in the knee will lead to changes in riding techniques and the production of torque. By allowing the body to “breath”, the athlete will be able to attain his or her own genetic potential. Other than angles, the flexibility of individual joints and stretch ability of muscle groups will also directly influence the workable biomechanical angle. For the rider, there are three contact points on the bike. In the case of the time-trials (TTs) and triathlons, there are four. They are at the handle bars, pedals, saddle and the additional aero-pads for TTs and Tri’s. The special relationship between these three or four contact points will determine two other factors. They are comfort and power output. These two factors will in-turn determine your efficiency and hence your sustainable speed. If a rider were to score high in both areas, we can predict that the athlete will almost certainly attain his/her full potential with the assistance of a structured training programme. Ride posture will help us utilize the muscle groups used especially for cycling and have to be considered when roping in the necessary muscle groups used to generate torque. This is where ride symmetry is extremely important to help support the torso which gives stability to the pedal cycle. The legs like pistons need to be moving in a straight plane for efficiency to be at its maximum. Once the knee is brought back to alignment, this will ensure maximum efficiency as both ankle and knee can travel in one smooth vertical motion. Once this is done correctly, the feet will feel comfy and yet is working at its maximum efficiency with the least chance of soft tissue injuries. In cycling terms, this word is synonymous with sheer riding enjoyment. With this new found enjoyment, you will want to cycle more frequently for a longer duration at every session. In times of muscular fatigue, more often than not, other parts of the body that were not directly involved with the pedalling motion will start to ache. If this is allowed to continue, injury will set in and the love to ride will diminish. These are the other muscle groups which are recruited for the purpose of providing upper body stability. This is a clear sign that the athlete is not used to riding and more often than not, is not properly fitted to his or her bike. Flexibility and muscle tension has also a role to play in this scenario. A more common tell tale sign of discomfort that will usually start to surface in the first half an hour of an easy to moderate pace cycle, will be when the upper or lower back starts to ache; shoulders begin to get fatigued; the sole of the feet hurt; followed by knee discomfort and numb fingers. To really test it to the limit, go for at least a 3 hour ride. If the athlete encounters any or a combination of the mentioned areas of discomfort, there is high chance that the riding position can be further improved. Most riders assume that power transfer is the only factor for a fast ride. More often than not, this effort will include the proper coordination of your muscle groups found in your legs and other indirect parameters. From the contraction of your muscles to the torque applied to the crank is a series of complex levers and hinges that allows the transmission of force. From the use of specific angles and saddle positioning, we will be able to determine the optimal power output you are able to get out of every pedal stroke. This will also help you prevent injuries in the future. Another factor that will determine the level of riding efficiency will be the aerodynamics of the rider and bicycle. As a rider achieves fitness competency, he or she will be able to maintain a higher speed for a sustained period of time. Riding in a position which is too upright (though more comfortable) is one sure way to increase frontal area. On the contrary, having too stretched a position (excellent for a low drag coefficient) will certainly invite back and shoulder aches, and in quite a number of cases a loss in power output too! A balance is achievable between aerodynamics and power output. The only way to arrive at this illusive balance is by having a trained set of eyes observing your pedaling technique on a cycle-trainer or a Juteau Cantin Platform. Workable biomechanical angles are employed to make sure the rider is sitting at the correct saddle height and the pelvic-torso angle is at the optimum angle. 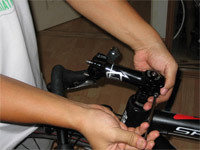 By obtaining the recommended stem length using the Juteau Cantin Stem Finder Tool we may or may not be follow up with adjustments on your cockpit length depending on the individuals riding experience. Cycling mechanics is a repetitive. The constant need to achieve efficiency requires the athlete to keep practicing till he or she attains that state of unconscious competence. The price is laborious hours of relentless training. The side effect of relentless practice is strain injuries, due to overuse. One way to minimise the onset of overuse injury is to minimise the strain on the particular joint and share the load to other joints hence reducing the chance of injury. This is especially true for the athletes training for endurance events. How many riders in the world can say that they are truly confident that their positioning is as efficient as it can get? How many riders are confident that their positioning is already optimal? How many riders know how their bodies are built and what to look out for in their next bike? After every Full Bike fit only, will a Scalar diagram be sent via email in PDF format to the rider.